As a freshman I was most excited for the gamedays during football season, and you should be too. 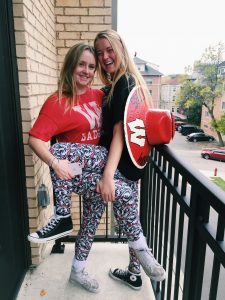 With that said, you’re going to need a lot of Wisconsin apparel. You can go to the bookstore and find endless clothing, but you won’t find a Bucky sombrero anywhere. The best decision I made before leaving for college was packing my oversized hat made on the beach in Mexico (featured below). I’ve worn this sombrero to many tailgates; it was the staple to every one of my gameday ensembles. The best part was that no one else had it- until junior year when somebody took it off my head and ran… Regardless, I recommend that you find your own Bucky sombrero (also mine, if seen on campus please notify me) whether it be your dad’s vintage jacket, your mom’s old cheerleading skirt, or even just a cool shirt from goodwill. There’s nothing better than sporting your school spirit with a one-of-a-kind accessory.